Donetsk owes its historic and economic importance to its abundant mineral resources. It was heavily mined for coal during the Industrial Revolution, and is now exploited for its large deposits of salt, almost 90% of the country’s total production. The oblast is known for its curative mud and minerals, and its proximity to the Azov sea coast and its shallow waters makes it a nice place for recreation. 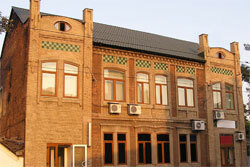 There are resort hotels, sanatoriums, rest homes, boarding houses, and children’s camp sites in the region. Donetsk City is the industrial capital and administrative centre of Donetsk oblast. It is one of the largest metallurgical centres in the country. The city has lots of mine waste heaps called terakony, a constant reminder of the city’s glory as the centre of coal mining. They add an interesting contrast to the city’s modern buildings, large square parks, and tree-lined streets. Despite being highly industrial and the distracting jumble of railroads and highways, it is easy to say that Donetsk is a clean and green city, and actually beautiful, thanks to dedicated sprucing. It earned a nod from UNESCO once as a clean industrial centre, and is called the “City of Roses”. Interesting sights in the city are the museums, theatres, and the philharmonic hall. Leisurely walks along the river and Pushkin Avenue and around Lenin Park can also be rewarding. The city’s main street is Artema, where government buildings, shops and hotels are concentrated. There are many residential towers in Donetsk, some of which lie on the banks of the artificial lake Kalmius at the city centre.